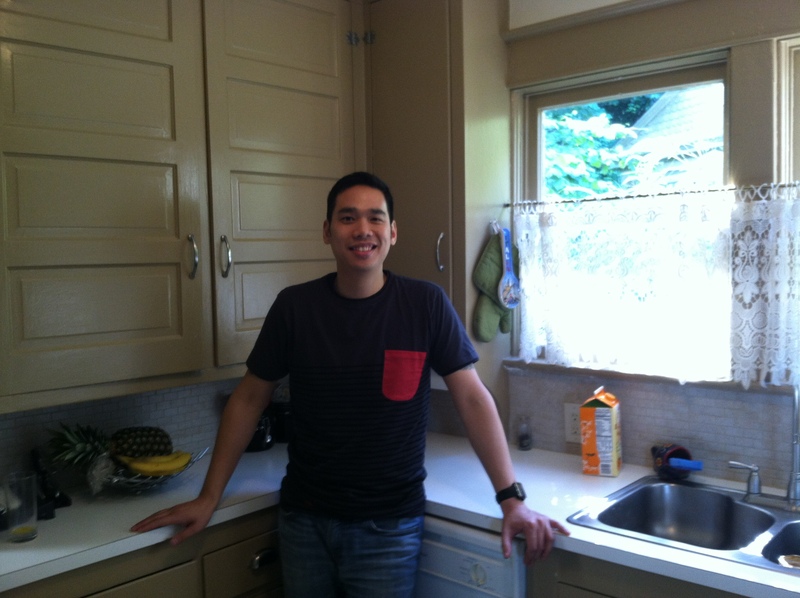 We’re delighted to introduce you to Darrick, the Portland homeowner who worked so hard to win our recent Small Kitchen Makeover Contest in collaboration with Portland Monthly. Darrick and his wife Monica gathered an impressive group of friends and fans to help drive their kitchen to the top of the voting. They built a list of people who received daily text messages reminding them to vote and even worked with Darrick’s sister-in-law, a volleyball coach, to engage the entire volleyball league in rooting for and voting for their kitchen. Of course, now that they’ve won, there are thousands of delighted friends and family members hoping to follow the progress of their kitchen design and help them celebrate their success. For that reason, Darrick and Monica have given Arciform permission to follow their project from start to finish on our blog, providing insights along the way into the kitchen remodeling process that might be useful for anyone considering a kitchen remodel. 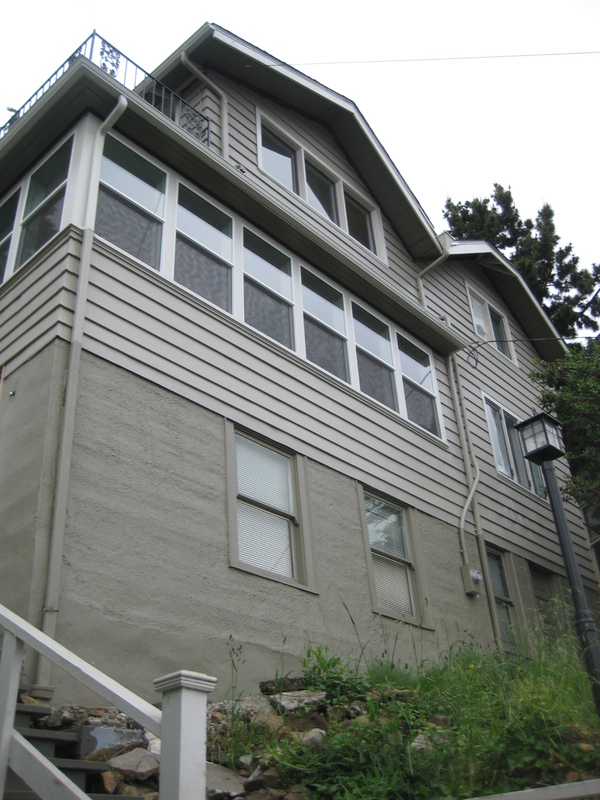 The back of Darrick and Monica’s home nestles up against the hill face, with the back kitchen door opening out to nearly scrape the rocks of the hillside behind them. It’s a beautiful space, full of 1920s charm, and a big change from the Beaverton condo Darrick lived in before they married. Darrick’s dad is an experienced DIY remodeler, and the couple gave the home an overall facelift with fresh coats of crisp white and grey paint as soon as they moved in. The only space they left completely untouched was the kitchen, a tiny space with narrow counters and extremely tall upper cabinets that were built in place along one wall on site and a tiny pantry that houses an awkwardly placed refrigerator. 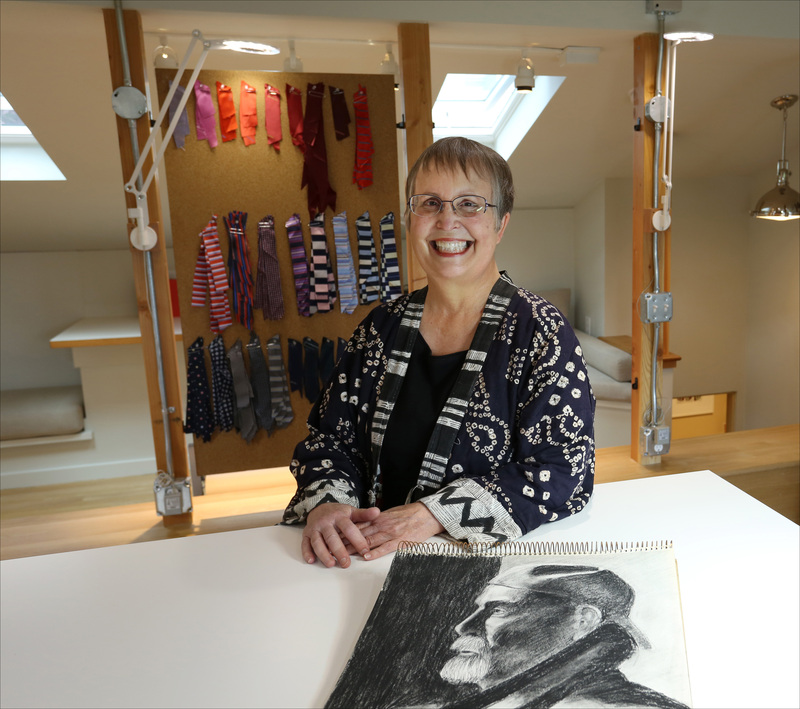 For this project, Arciform selected senior designer Chelly Wentworth, a highly experienced designer with numerous awards to her credit and a special affinity for older homes, to work with the couple on the kitchen re-design. What were the first things you noticed about the Cifelli/Chan kitchen upon arriving into the space? The kitchen was very small of course, and mostly original. 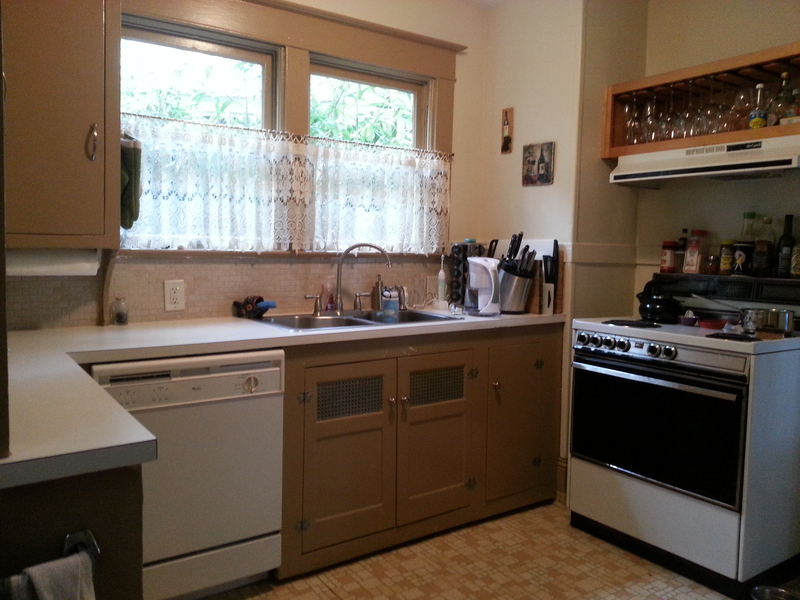 I am always amazed at how long these original kitchens remain in use. It felt very cramped and closed off the rest of the house. 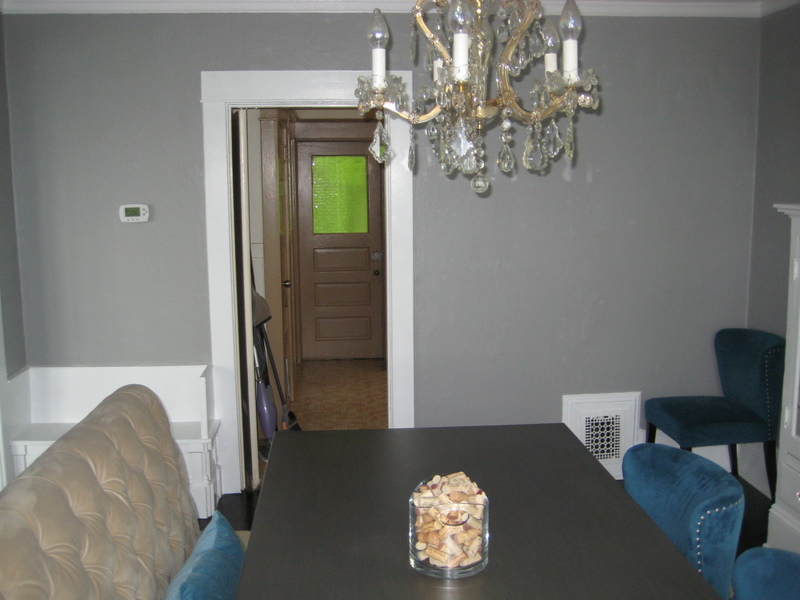 The colors and finishes didn’t reflect my impression of the homeowner’s style in any way. What are the anticipated challenges of the project as you see them? The refrigerator is currently located in a small pantry which is not ideal and there doesn’t seem to be another place for it to go. 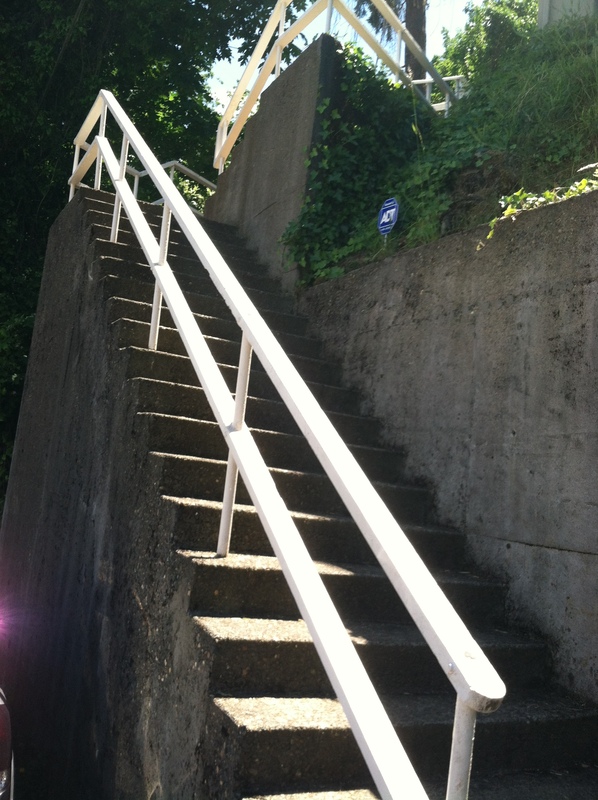 Plus, there must be 50 steps up to the home’ s entrance. The location provides great views but can make taking the garbage and recycling out a challenge. Usually when working in a kitchen this small I suggest more frequent trips to the garbage and recycling so we don’t lose valuable storage space to big pull-outs. With these clients it is not going to be an option. After our first visit with Darrick, what were the key insights that you got from the conversation that were subsequently incorporated into the first draft of the design? The #1 priority is to remove the wall between the kitchen and the dining room. We are planning to add a peninsula of cabinets that will provide a place for the range, extra counter space and a small eating bar. Their design aesthetic leans towards the modern side so key elements in the concept are clean lines and lack of clutter. When you first meet with a client, what ‘homework’ do you like them to do to help inform the conversation? I usually ask people to think about all the activities that will be taking place in the kitchen. For example, do they entertain a lot? Do they all cook or is there one person who does the primary cooking? What dietary considerations do they have? Do the buy a lot of prepackaged meals or make everything from scratch? How do they shop, do they own any special equipment like a 20” tall juicer, etc? Does anyone in the household have any special hobbies like canning or beer making that will take place in there? Do they want seating in the kitchen? I also ask them to tell me what decisions or selections have already been made and if any of them are set in concrete or if they can be flexible. For example, many people want double ovens and a microwave (which can be very difficult to accommodate in a small space). I also ask them to think about what they like and dislike about their current space and if we will be reusing anything that is already there. Finally, I ask them to gather an idea file so I can get a feel for their style and what types of things they like. Darrick and Monica are avid wine lovers, tea drinkers and ramen noodle makers with a penchant for the latest technology. 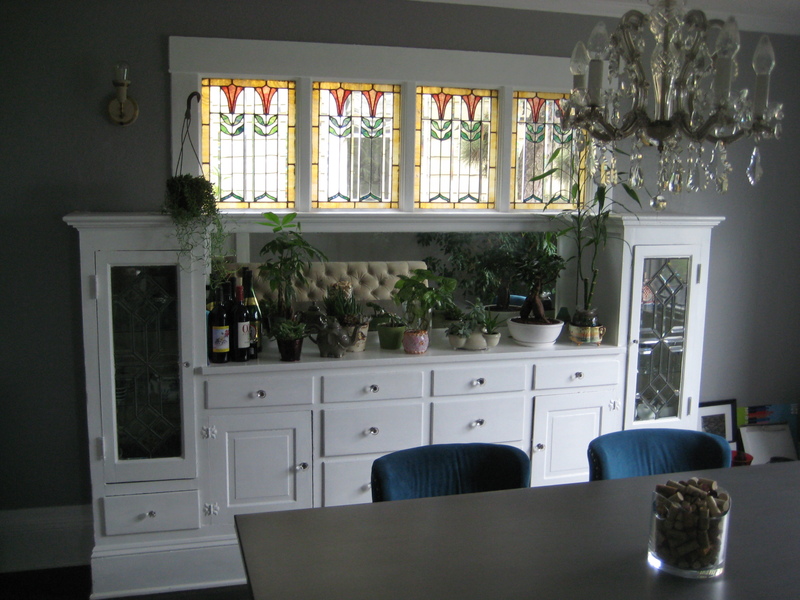 When asked what was on their wish list for a dream kitchen, they listed Carrara marble counter tops, a wine fridge to showcase their favorite vintages, a hanging pot rack and a pot filler for the sink. Darrick would love anything that integrates some cool technological elements into the space, but they are careful to be respectful of the home’s vintage character and charm. They would like the kitchen to feel more open and connected to the rest of the house and they desperately need more storage space and counter space. 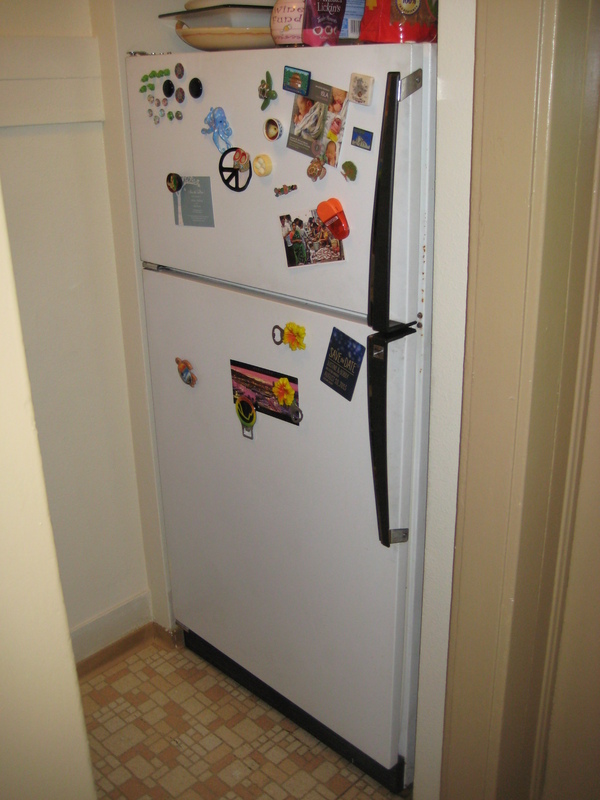 Finally, they are hoping to create easier access to their fridge. After Chelly’s initial meeting with Darrick, the next step will be to create the ‘as built’ documentation– an accurate three dimensional rendering of the current layout of the kitchen that will allow her to begin exploring potential solutions to the design challenges presented. Then, they will meet for a design presentation, where the first draft of the proposed design is reviewed by the clients and refined based on their feedback. Once a concept has been determined, there will be a “budget check” where a rough estimate of the approved design will be sketched out in order to confirm that the design can be constructed within the client’s budget parameters. We hope you will follow along with us as we track each step in the process of this makeover and we welcome your questions and feedback along the way! Next week’s post: The design presentation. Endangered Places, a historic smokehouse. We’ve had a great few days at the smokehouse. Here is a brief report of what we’ve found and done. When we got there, the building was leaning seriously forward and to one side. My heart sank as I thought it might have been way too far gone. I didn’t even want to take a picture. The owner had the church group come out and “clean out” the smokehouse, which sounds exciting, but they also removed some of our structural support and staircase. The staircase was the only thing giving the building shear strength. Well, we didn’t let that get us down. We had it back up and straight by lunch, but that ate into our labor hours by 1.5 man days. Now that we had the structure straight again, we started doing pin point measuring and got all four corners level and plumb. It really started looking great, at least to those who had seen it within the last twenty or so years. We are making headway! Then, we cut the rotted studs ends and put a new plate under the long wall on the right side of the building. (All of my directions are if you have your back to the main house and you are looking at the sliding doors) We then added a temporary shear panel to the interior of that wall to give the building rigidity that it never had. The opposite long wall was destined to be re-framed, so we removed that wall completely after shoring up the rafters and adding three replacement floor joists. When we got deeper into the removal, we found evidence that the side door was added later, so we made the bold decision to frame the new wall without the doorway. The door was set to the side for safe keeping. 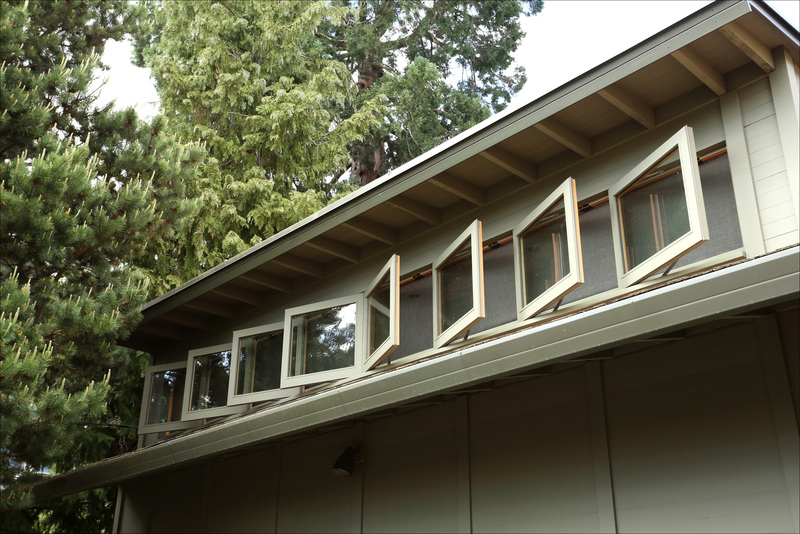 Another bold move was that when we found that about two-thirds of the front wall had been replaced with new framing, or that the few old studs that were left had been rotted up about four feet, we decided to cut the lower portion of the studs out behind the new ceiling joist. This way, plans can be made for future use as to how the doors would want to be installed. Either for convenience, or historical accuracy, the groundwork has been laid to make and implement a quick and easy application. A new sill plate has been installed to aid in this. All of the framing being used is vintage barn wood of the same species and compatibility with the rest of the structure, When necessary to mill the wood to new dimensions, we placed the cut side towards the siding side so the fresh cut wood is not visible or distracting from the appearance. While digging, we noticed lots of remnants of the original brick infill foundation and used that material and other brick from the property to dry set supports for the new pressure treated sill. The original structure appeared to be above grade which allowed air to flow in from the ground level, probably to aid in circulation for the action of the smokehouse. A new top plate timber was created with matching notches to receive the wall studs. Three or four new rafters will be installed tomorrow, and the skip sheathing will be installed with new old barn wood where appropriate. New fasteners, where appropriate were hidden. The intent is to leave the smokehouse free standing and framed completely. The temporary support beam and bracing will be removed Thursday. Siding, original wood, the doors and window will be left in the structure after back-filling and raking the dirt floor. The plywood shear panels will be left as a measure to continue and protect the building. These can be removed in the future as they were installed with screws. (the original studs had many nail and screw holes, so this did not deter from the originality of the structure.) Arciform will re-asses the finances and if there is money left over, will provide and install standard galvanized agricultural metal roof panels to protect the building. Traditionally, the building would have had wood shingles. This will be done during the summer season when our work schedule opens up again between jobs. 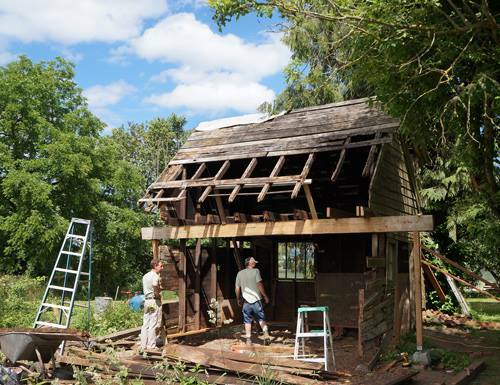 We can’t wait to see the finished restoration of this historic smokehouse. We’ll keep you posted. First Repair Café a Success! 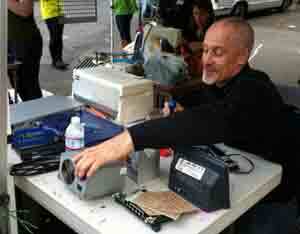 The first Repair Café event is under our collective belts. And it was a blast! Huge sigh of relief. Huge. Right on, Portland! There was a little hiccup in the beginning as the repair tables and equipment were blocking NE 17th Ave, per the fire marshal. Damn rules and regulations! Safety first? Who cares about that stuff? (Well, people do.) The group did a quick bit of juggling and planted the two tents in front of the Umoja Center. Things were up and running by 6:30pm. What with the tents, tables and chairs, signs and equipment and tools brought by the repair volunteers, the group definitely displayed a presence. I’m not sure the Last Thursday habituées were prepared to see a sewing machine – complete with a seamstress – plus disassembled computers at the (depending on when you dropped by) hippie/ster festival (or, perhaps, debauched event) that is Alberta Street once a month in the summer. The sewing machines and computers did offer certain appeal. Pretty soon, people were stopping by to ask What’s going on? The answer? It’s a Repair Event – Renee and Terra are sewing, Bryce is working on electronics, and JD is showing people how to polish and care for their shoes. We’re keeping things out of the landfill, baby! Do you have anything that needs fixin’? One gentleman dropped off his jacket for Renee to repair and picked it up on his way back down the street, but this time around it was mostly the volunteers who got their stuff fixed. 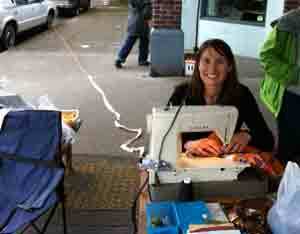 And that’s cool – volunteers are repair-worthy! (FYI – that’s a good reason to volunteer! Handle the mailing list, baby, and get your computer fixed. Perfect trade.) People saw the group, added their names to the mailing list, AND they found a lot of prospective volunteers in the crowd. Not a bad night’s work! Plus, Becky, the owner of Ford, will also be doing free résumé editing. Nice. And, a big shout-out / thank you to Grand Central Bakery in Beaumont for the much appreciated and much needed food during the inaugural event! Oregon’s brief but brilliant summer months demand to be celebrated with frequent backyard dining adventures. The trouble is, there’s never a great place to prep the meat for the grill… and where do you put the grilled corn while you are waiting for the sausages to finish? A chef with a sunburn is never attractive… and wouldn’t it be nice to have a sink to wash up as you go? Sounds like it’s time upgrade to a full outdoor kitchen. What direction does the wind blow? Typically, Portland area winds come from the south & southwest, so screening elements at the southern end of your space will keep your napkins and work utensils from blowing away in a sudden summer breeze. Where is the sun? East-facing spaces will be cooler in the evening. If your backyard faces west, add in curtains to screen the late afternoon sun. 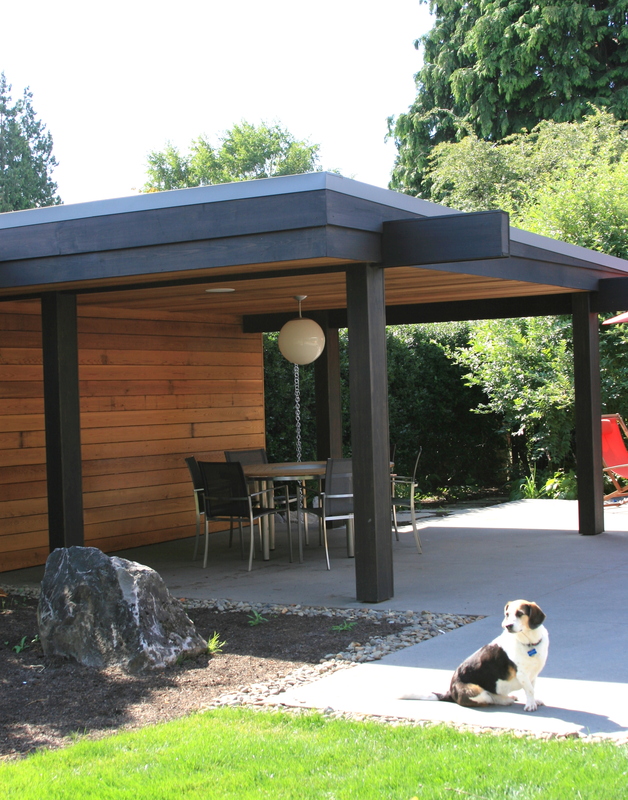 This east-facing pavilion provides ample shade and the gently sloped roof keeps the area dry and comfortable. 2. Integrate Your Natural Wonders. Carefully consider existing trees and shrubs to ensure you are making the most of their beauty and shade without causing future maintenance headaches from expanding root structures or falling fruits. That cherry tree creates a beautiful show of color in the spring… but will it stain your decking when the leftover cherries come down in the fall? 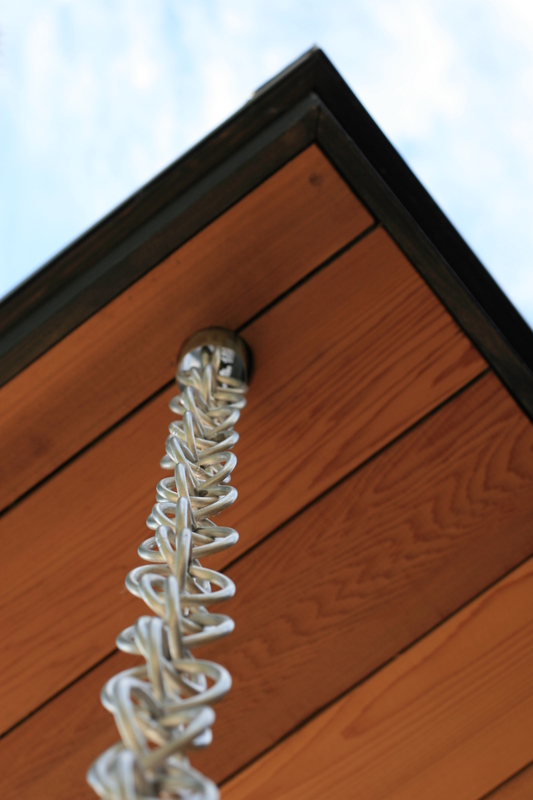 Rain chains can help manage rainwater runoff and create visual interest in your outdoor kitchen. 3. Manage Your Rainwater. It’s safest to assume that every surface in your outdoor kitchen will get soaked at some point. Minimize the damage by selecting waterproof surfaces and creating gentle slopes on all horizontal elements to encourage water to drain away from your public spaces and foundation. Great waterproof surfaces to consider include concrete, yellow cedar, stainless steel, stone, quartz or copper for a naturally antiqued look. 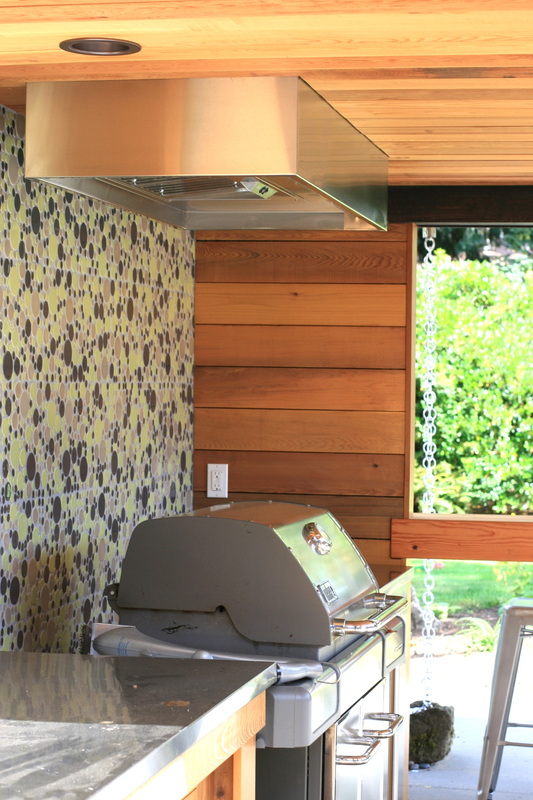 The tile wall on this outdoor kitchen adds personality and interest… and provides a durable waterproof surface. 4. Create a Utilities Plan. Utilities can be connected to your home’s main supply and waste lines to provide complete electric, gas and water hook ups, but this can get expensive. 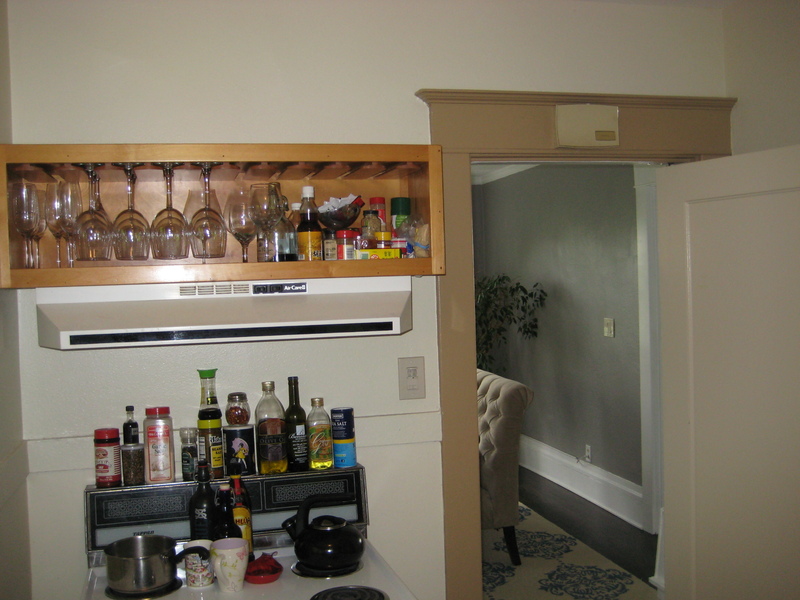 Another approach might be to use a tank-based propane grill or cooking appliance and to connect your sink to an existing outdoor hot and cold water spigot. Buried pipe connections can route your waste water to an appropriate exterior garden feature or rainwater catch system. Be sure to use phosphate-free dish soap to protect your plants. Stainless steel counters flank the client’s own Weber Genesis gas grill. Note the integrated vent hood (from Zephyr Essentials) to handle airflow and exhaust. 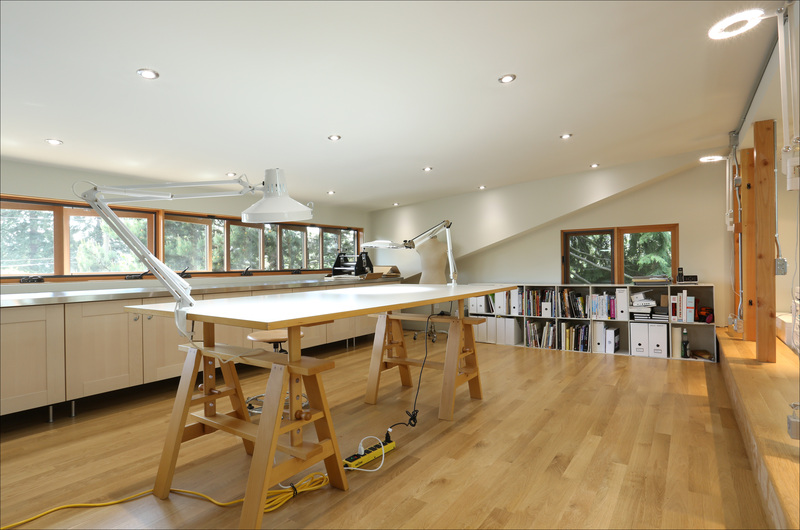 This client elected to install permanent integrated can lighting fixtures for a polished look. 5. Light the Night. You don’t need to invest in a permanently wired exterior lighting fixture to have a festively lit outdoor kitchen. Strings of inexpensive exterior chain lights with colorful shades can add charm and task lighting. Balance your lighting plan with candles, oil lamps and fire pits to keep things warm as the night settles in. 6. Create Airflow. Don’t let your 4th of July feast end in smoky disaster. 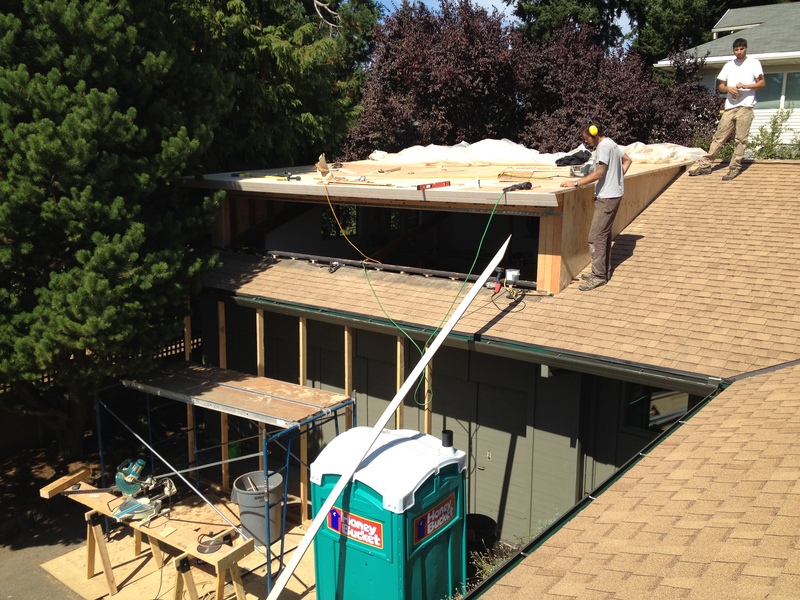 Be sure your structure’s roof includes appropriate venting for your cooking surface. Prevent mold and mildew on your permanent structures by encouraging airflow around and through the space. A built in bar and metal stools add seating options without adding to the footprint of the space. 7. 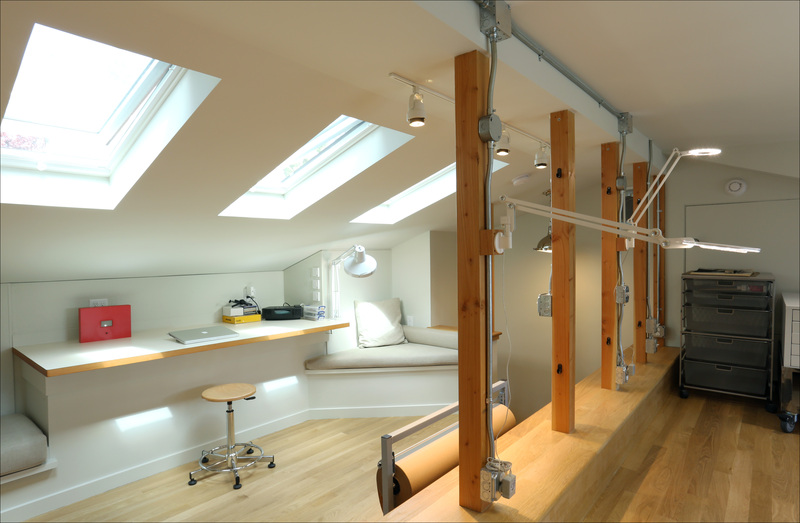 Consider Seating and Storage. 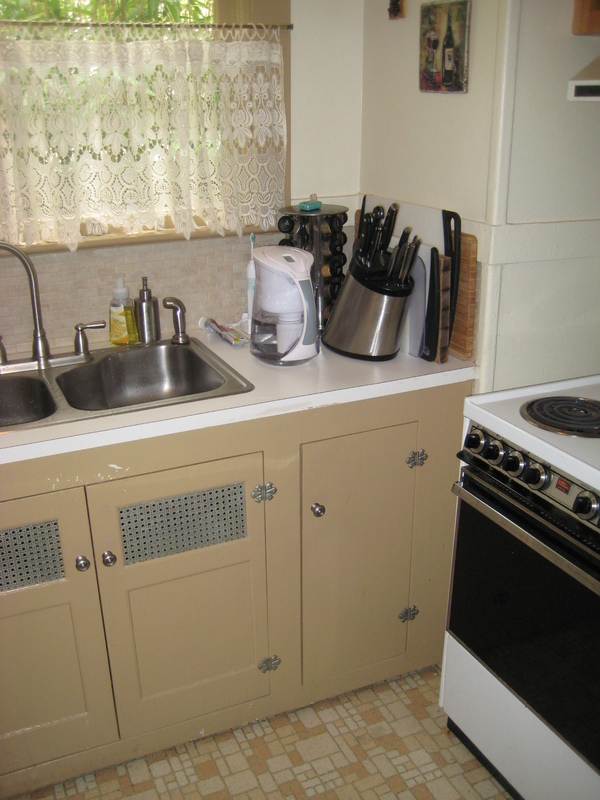 Where will you store your furniture and cooking utensils when not in use? Integrated storage benches can shelter your soft goods while adding flexibility to your seating plan for larger groups. Add a broad ledge to a nearby raised bed to create additional seating that will give your guests an up-close look at your favorite blooms and veggies. A moveable island can be tucked under cover in inclement weather or stationed in the garden on sunny evenings to create an inviting satellite buffet station. 8. Delight Your Senses. Rain chains create soothing sounds… and aromatic herbs in nearby garden beds will whet your appetite for the dinner to come. For the ultimate treat for the senses, add a hot tub tucked halfway under an overhang (to enjoy during inclement weather). Leave the other half open to the stars for those rare clear summer nights. 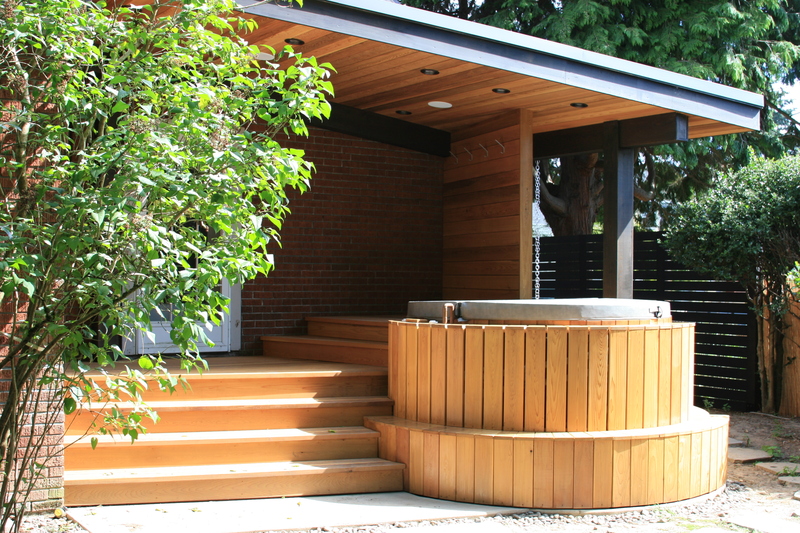 This cedar hot tub enclosure featured spiral stair steps and integrated covered dressing area with towel hooks and wood decking for maximum comfort for barefoot feet. The exterior path includes natural stone pavers embedded in pea gravel directing guests around the side of the house. 9. Pamper your Feet. What flooring surface will you provide that will drain well but be gentle on new summer feet? Pea gravel and natural flagstones can be an inexpensive option, but keep in mind that their uneven surfaces can trip up guests at the end of a long evening. One practical but beautiful surface? Exposed aggregate concrete with a dark stain. 10. Frame the View. Finally, what will your outdoor chef have to look at while whipping up that grilled salmon and asparagus? Add keyhole windows to frame secret garden views that can be enjoyed by chef and guests alike. Utilize perforated screens and semi-transparent materials to create interesting perspectives of your favorite garden features while keeping the wind and rain at bay. 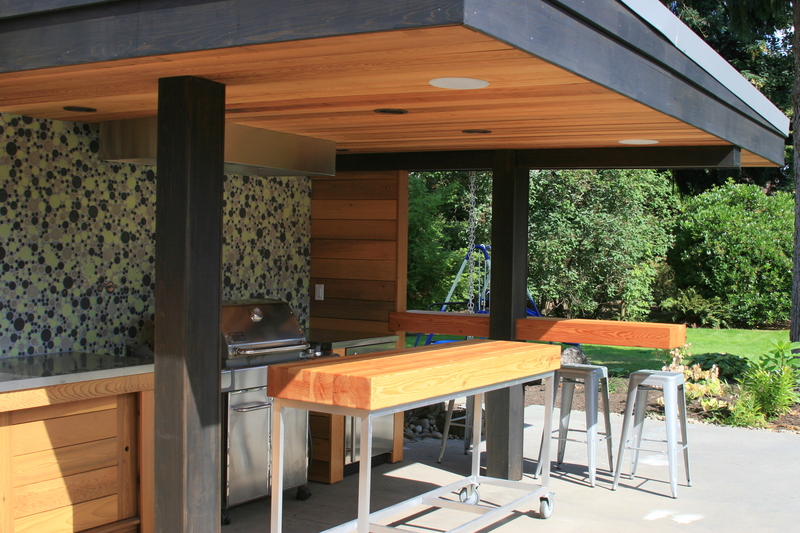 An outdoor kitchen can transform your enjoyment of your home during the warmer seasons, expanding your living space and creating an inviting and convenient space for outdoor entertaining. We are delighted to announce the addition of Senior Designer Chelly Wentworth to the Arciform Design Team. 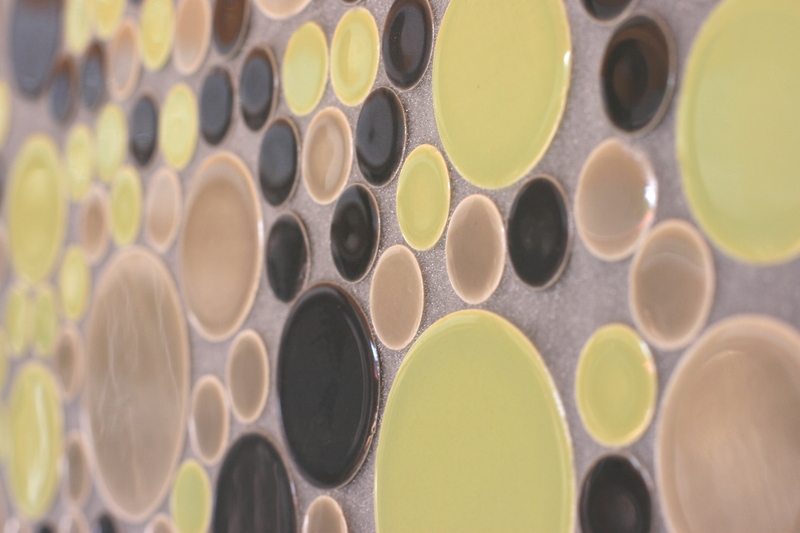 Chelly holds degrees in both Clinical Psychology and Interior Design and is a Certified Kitchen and Bath Designer through the National Kitchen and Bath Designers Association. 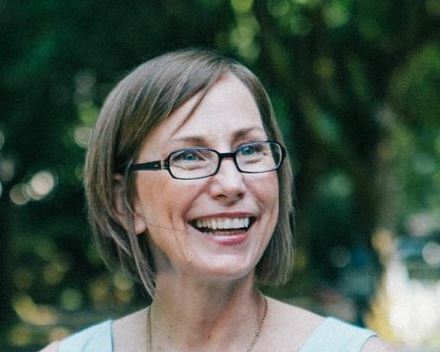 She also holds certifications in Aging in Place and has served on the Portland board of the National Kitchen and Bath Designers Association as a VP of Professional Development for three years. When did you know you wanted to be an architectural designer? Tell us how you got inspired to do this work. I first fell in love with art and architecture while studying fine arts in college, several years later, I decided I had to pursue design while standing on the steps in the vestibule of the Laurentian Library in Florence, Italy. (It was designed my Michelangelo) It was so beautiful it brought tears to my eyes. I also love to cook and entertain . 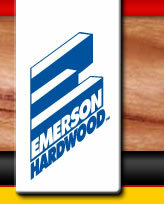 Specializing in residential design allows me to make a career out of all the things I am passionate about. Describe one of your favorite design projects. What were the challenges? What were some of the features that made it memorable? 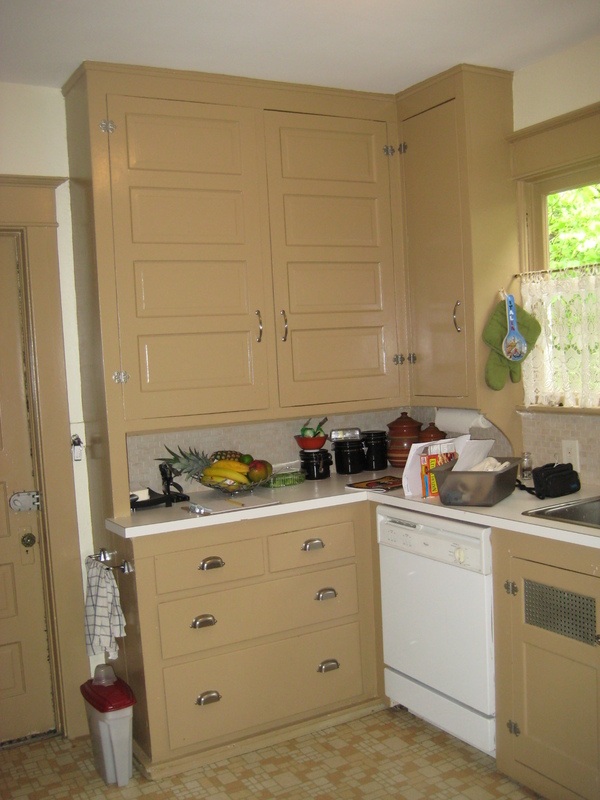 It was a kitchen/addition project in a Laurelhurst Colonial Revival home. The clients were newly married and were planning a large family. They love to entertain and are passionate about cooking – in fact, the husband was studying to become a pastry chef. He wanted to be able teach his craft to disadvantaged youths and asked for a fairly large kitchen space. The challenge was to integrate a kitchen that would meet all of the homeowners’ wants and needs and still fit the integrity of the house and neighborhood. 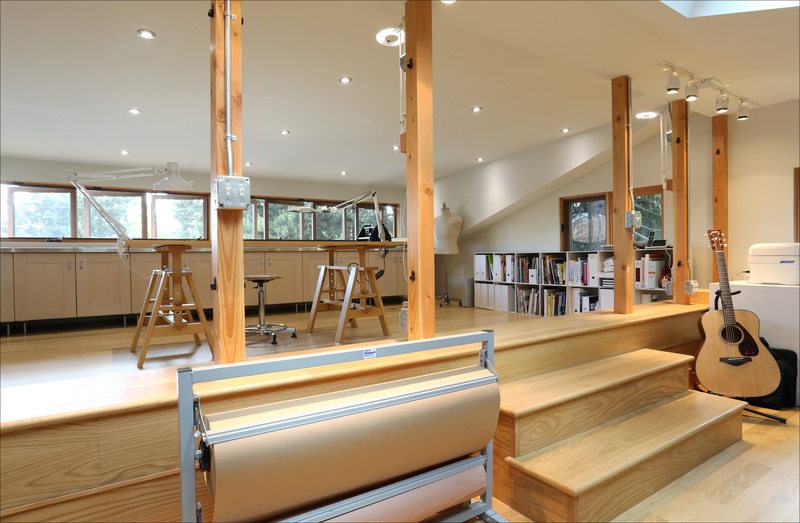 The collaboration resulted in a very functional and beautiful space, but most importantly a very personal one for the clients. Beyond following the basic elements and principles of good design, a project must satisfy the goals of who and what it is being designed for, both aesthetically and functionally. It’s my job to use my training and experience to act as a guide to help clients create their vision. I know something is “right” when people say they love what we have created for them. What’s your working style? How do you like to work with a client? I like to ask a lot of questions and make few assumptions. If I really listen to them I have a better shot at ‘nailing it’ with the design. This is always a difficult question for me since I am pretty satisfied with my life. We are so happy to have Chelly join the Arciform Design Team and we look forward to following a few of her next projects on our blog.